It really does “take a village,” as the saying goes, to get a job done right. No more so than in a company that provides beautiful, affordable, and completely unique theatrical draperies and supplies to concerts, trade shows, schools, churches and productions all over the country. To help get the rental and custom-built goods where they need to go, and when they are needed, takes an incredibly talented, skilled, and industrious team of folks that care as much about the products they are shipping as the clients who are receiving them! I am proud to say I work with some of the most intelligent, engaged colleagues imaginable, and that I regularly see their hard work come in to play. On a daily basis, as the Logistics and Traffic Coordinator for Sew What? Inc. and Rent What? Inc., I experience firsthand how much work it takes our entire sewing staff to get the soft goods built, inspected, and ready to ship to our clients. However, I also see how much tireless effort our shipping team puts into making sure everything is prepped, packaged, and ultimately shipped out (or shipped back to us for our rental products), and they still continue to impress me! In our rentals and receiving departments, Chris and Jimmy ensure that all received inventory is applied to each rental order, and arrange and package our outbound goods in what we’ve been told is the most user-friendly, helpful way our clients have ever seen. Danny is responsible for all of the beautiful and spotless digital printing on our custom-built digitally printed soft goods. Raul helps make sure all of our purchased goods are packaged and shipped exactly where they need to go, no matter what time of day it is. Juan is our incredibly diligent company driver, making sure that all of our deliveries and pickups happen around town exactly where and when our clients need them, days—nights—weekends—and everything in between. And Rick, our Warehouse Manager, oversees everything and makes sure that everything is running smoothly, and steps in to help at a moment’s notice no matter what the issue is. I know that my world can become a logistical “tangle of knots” sometimes, and so I don’t know what I would do without the daily help of these amazing guys. Helpful, thoughtful, and extremely good at their jobs—it’s everything that we strive for at Sew What? Inc., and we are truly grateful for all of their hard work! 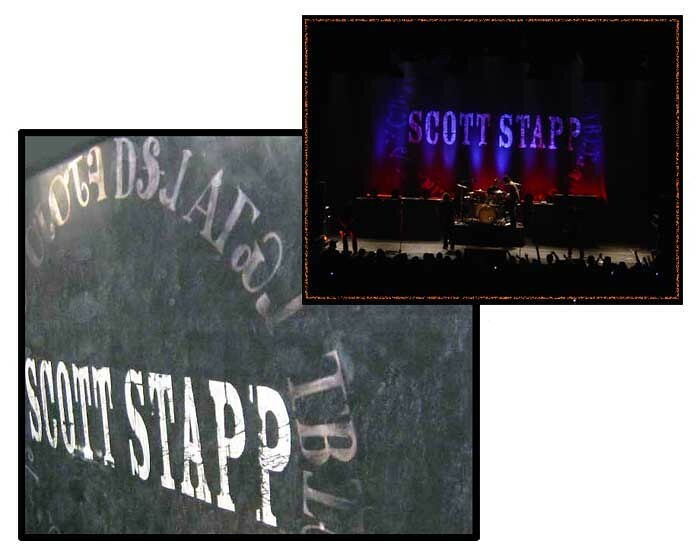 Backdrops and more…………… What are the benefits of digital printing vs hand painting? 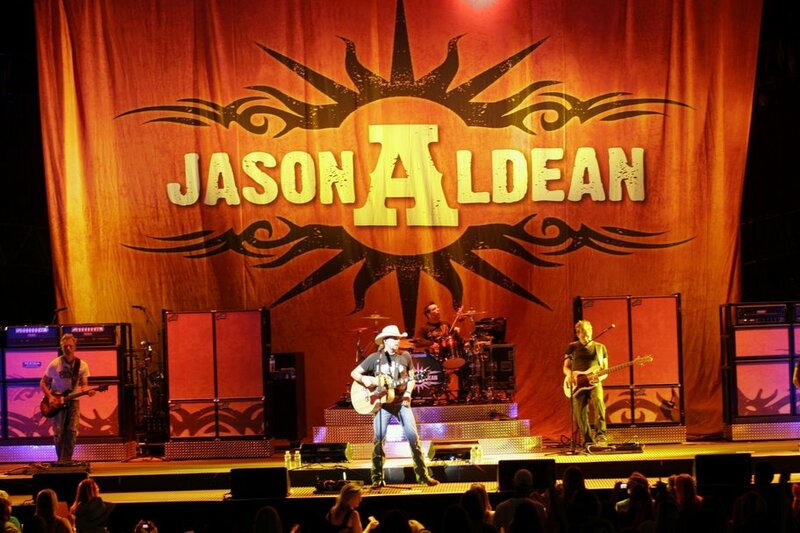 Do you have a backdrop design ready to go? Don’t know where to start? Printed, painted? It is no surprise that ordering a backdrop can be overwhelming for some clients. There is no one global approach when it comes to crafting a backdrop, and there are endless material options available that can impact both the look, and the price, of the finished piece. We generally recommend that the first question to ask is: How and Where will I Use My Backdrop? This is a great place to start as there is the greatest number of materials that can be used for an “indoor use only” backdrop. You will be able to choose from cottons, polyesters and poly/cotton blends. Any of the traditional drapery materials will work for indoor use and they are all flameproofed to standards that will hold the test of time when used indoors. If you want to take your backdrop outdoors – for say festival gigs or outdoor special event installations – then your material selection narrows greatly. We never recommend cotton products for outdoor use. They will shrink, rot or worse, lose the topical flameproofing chemical in a potentially damp setting. For an outdoor use backdrop, you will be directed to polyester products, as well as the more traditional vinyl coated materials such as vinyl and vinyl mesh. Next let’s look at design: Which of the below categories represents my design needs best? Either printed or hand painted may be options here. Digitally printed backdrops have the added durability and a reduced physical weight when completed, however hand painted backdrops have a charm to them that is unique. If your design is only an “inspiration image” and is not ready to be reproduced exactly as is – then an artist would be able to translate the image real time while painting your very own work of art with paint on cotton canvas. A typical scenic backdrop can best be described as an oversized painting on an expanse of cloth. We most typically use muslin or canvas, and most artists prefer to paint to a “neutral” or “natural” colored unbleached surface. Wide milled goods can be obtained in seamless widths of up to 35 feet – however, when cost is a factor, lengths of narrower, standard-width cloth can be stitched together. This method can also be used to fabricate the appropriate dimensions needed when the backdrop required is very large. Print it! You will get PMS color matching – bright bold colors – and you will know that the logo is reproduced on a grand scale in the correct format and with the right color output. Of course, you must always notify your printing vendor if a logo has specific colors in it – be sure to mention that you need color matching prior to the ordering process! Print or paint….. we suggest having it quoted both ways to see which fits the budget. Very basic textures can be quite affordable when hand painted and add lots of visual interest to a piece. Whether it’s a digital backdrop for your theater, concert or exhibit booth display, Sew What? Inc. offers all clients the same professional products, excellent customer service and fast turnaround to meet your deadlines. And last but not least: FAQ: How do I prepare my files for digital printing? Read our online file preparation guidelines for instructions and helpful hints. Of most importance is that the final output will be a direct reflection of the quality of the file submitted. If you are unsure of the file requirements, we recommend that you read our file prep guidelines or contact us for more information. In general, the original file should be at least 300 dpi when at 30% of the final output size. Contact us to guide you through the process. Check out our numerous product categories. Then call us at (310) 639-6000 or contact us for a free quote. Need ideas? Visit our various Portfolios, or our Flickr Galleries for past projects and then review fabric choices. Additional questions? Confused about the difference between drapery fabrics and types of curtains? Concerned about flame retardancy regulations? Online resources available to you include our White Papers with answers to FAQ’s, engaging YouTube videos, and always right here on our informative, Sew What? Blog. 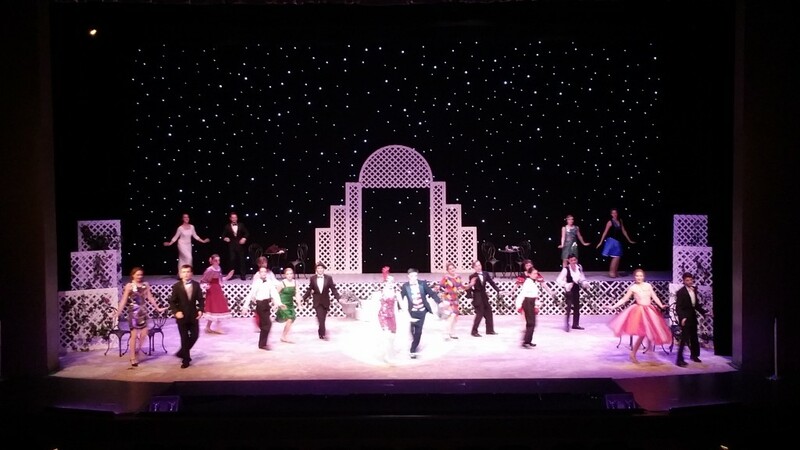 Our clients come to us when they want a beautiful custom-built theatrical stage drapery that is versatile enough to be used for multiple parts of a single performance, concert, or production, and something they can easily transition from one act to another. And not just rock concerts either— schools, churches and trade shows also appreciate being able to have a versatile drape that can be used in many different capacities for the same special event. 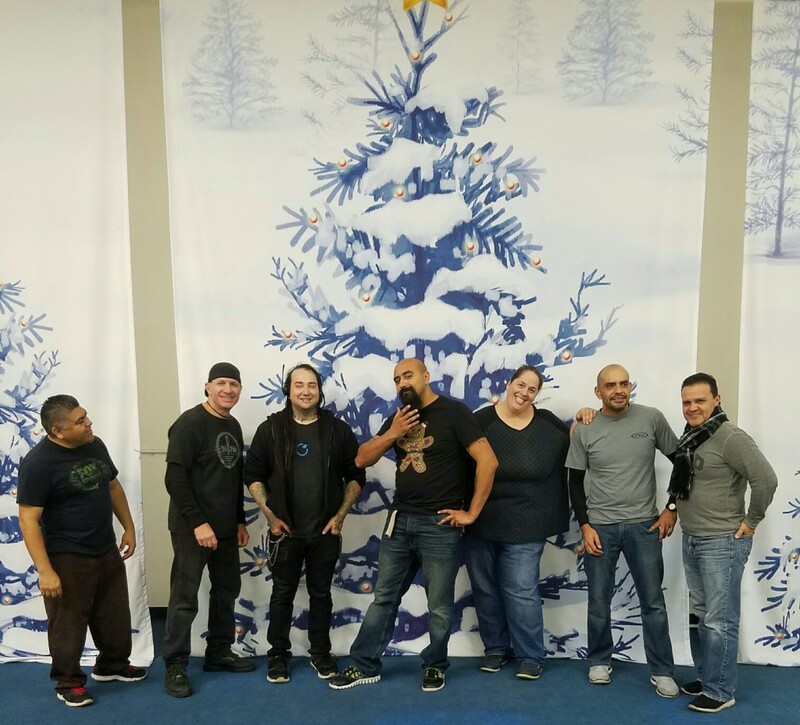 We love being able to help build a unique custom drape so that our clients get exactly what they envision! 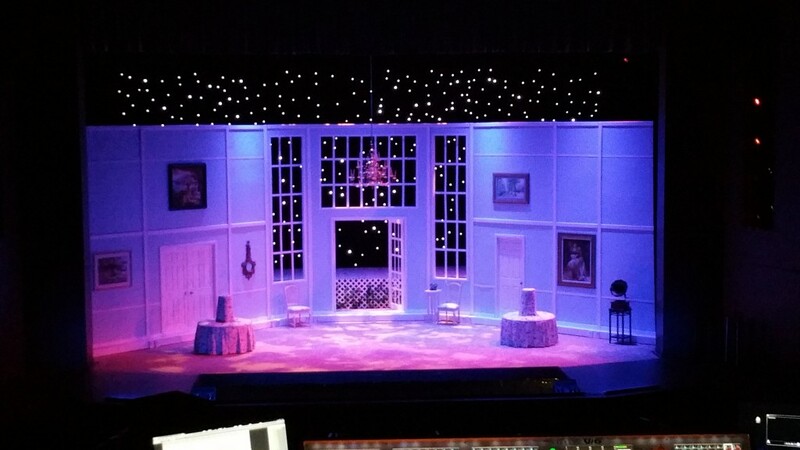 Recently we got to work with the Technical Director of The John Cooper School’s Performing Arts Department, Marcus Bridgewater, who needed us to build them a gorgeous Stardrop LED drape that would fit his stage’s unique dimensions, AND could be used for different scenes of their Fall production of The Boy Friend. At 22’h x 50’w, this stage drape is quite a bit larger than our standard sized Stardrop LED rental drapes, normally at 15’h x 30’w, and so they needed this special drape to be custom built to fit their specific stage dimensions perfectly. Blue-White LED lights on a rich backdrop of black flame retardant Encore Velour gave this curtain the look of a dramatic clear night sky. Easily programmable to have the lights either be completely static (in the photo above), or twinkling at any speed they desired (in the photo below), this drape helped this talented group of actors give each scene the exact look and feel they were going for. 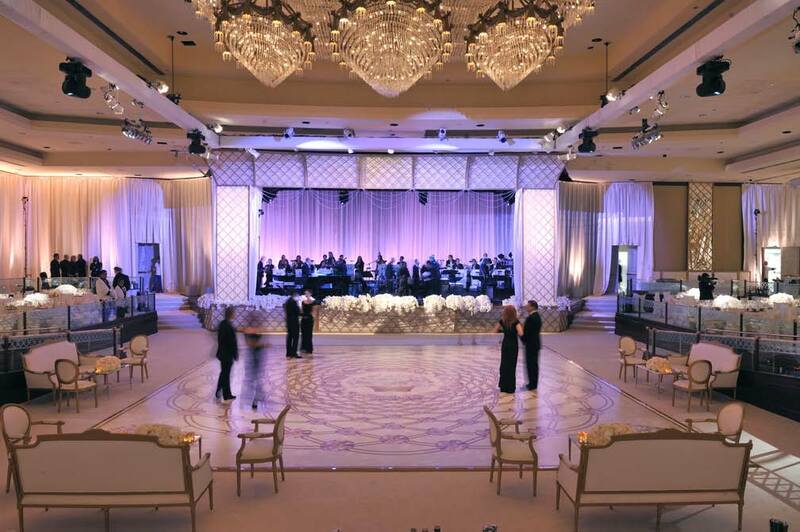 Let our team of experts work with you to assist in the process of figuring out what will work best with your own unique special event or concert designs — rental draperies, custom-built draperies, or a combination of both — and we’ll help you get exactly what you are looking for! Did You Know You Can Rent Curtain Track? Rental Track – Just as important as having beautiful curtains is to have reliable tracks that support and transport them across the stage. And when the drape fits the track and the track fits the drape, you’re in for a show! Whether it’s curtain tracks, canvas hampers or a new stage drape that you need, Sew What? Inc. offers all clients the same professional theatrical supplies and curtain products, excellent customer service and at reasonable prices. Don’t overlook our fine line of Canvas Travel and Storage Hampers. 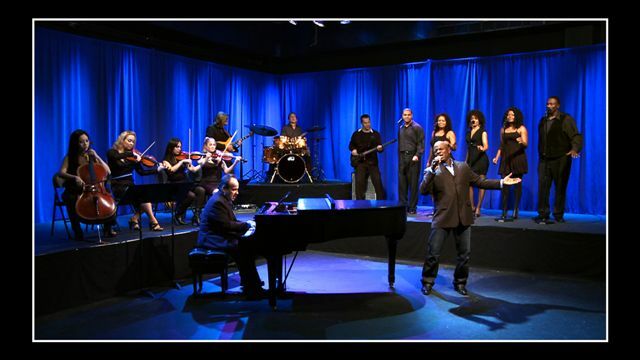 We welcome any questions about your own theatrical curtain track and supply needs – just complete our web inquiry form or call us at 310-639-6000. What Is Pipe and Drape? Read All About It! Perhaps you have heard the terms “pipe and drape” or “pipe and base,” but you aren’t clear what these terms mean, or how pipe and drape works. Not to worry – we’ve got you covered. “Pipe and drape” and “pipe and base” are interchangeable terms that refer to a system of portable components typically used to create exhibit booths such as those used in trade shows. Typically, the hardware components consist of steel bases along with aluminum uprights and drape supports (“pipe and base”), while the drapery is hung on the drape supports. 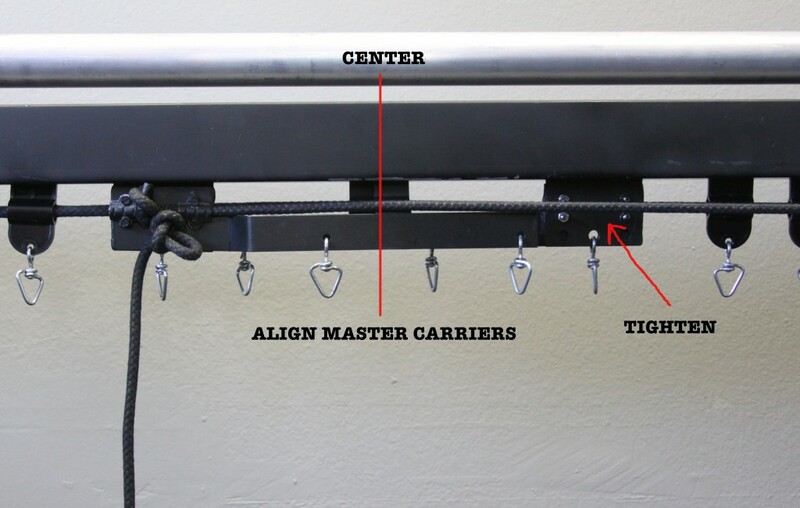 With a slipfit system, such as the system that we offer for purchase or rent, each upright is attached to a base via a pin and screw assembly. The uprights, which may be standard (fixed length) or adjustable, have one or more sets of 4 slots, positioned every 90 degrees. The telescopic drape supports, which have hooks on either end, fit into these slots. The configuration of 4 slots at 90 degree positions, allow you to attach up to 4 drape supports to each upright (such as when configuring multiple booths side-by-side and/or back-to-back). Shorter uprights have just one set of slots, while 6′ or longer uprights have two sets of slots (one at 3′ from the bottom and one at the top). This allows you to create a booth with a higher back wall and shorter side walls, such as this. Typically drapery is made as flat (unpleated) single width panels (typically 4′ to 5′ wide, depending on the fabric), with 3 to 4 panels used for every 10 feet of drape support width, to allow for natural fullness. These drapes generally have an open 5″ top hem to allow the drapes to be threaded onto the drape support. Banjo Cloth is the most common economy choice for exhibit booths, but other fabrics, such as 15oz Encore, are often selected when greater opacity is desired. 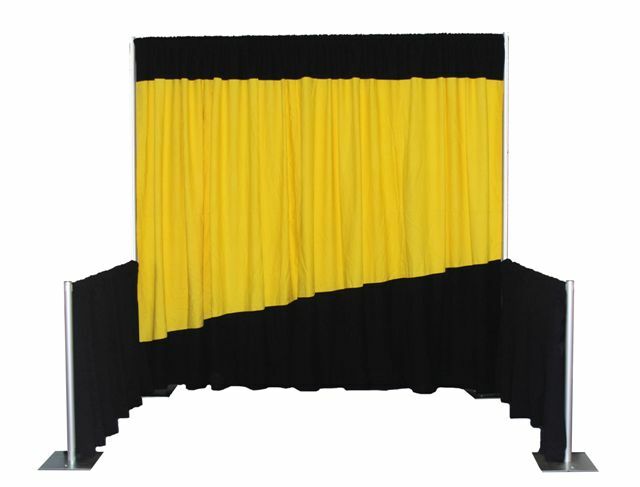 Custom drapery is also an option for those wanting something different, with a multitude of drapery style possibilities ranging from pleated drapes to digitally printed backdrops to non-operable Austrians and more. Want to learn more about how you can use pipe and drape for your next trade show, performance, or special event? Contact us at 310-639-6000 or on our website – we’d love to help! We have a number of different hardware and drapery options available for purchase or rent, to fit nearly any budget.